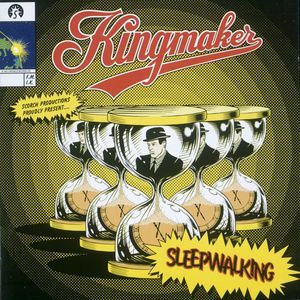 Kingmaker – Sleepwalking | NoCoda. What It Sounds Like: Early 90s alternative rock from Yorkshire, full of steady melodies and good times (despite the unrest that may be found in some of the political lyrics). Maybe a possible hybrid of R.E.M.‘s indie side and Collective Soul‘s lush side with a dash of The Hooters? This certainly was a surprise to me when I threw it in the CD player the other day. Wayward cloned men in black hats? Hourglasses with “X”s? “Sleepwalking” spelled out in an exclamation bubble? I was actually expecting some fast-paced punk. What I actually got was something even more enjoyable. I was obviously completely unfamiliar with Kingmaker before picking up this record, and while it’s nothing groundbreaking, it’s certainly worthwhile to add to the collection. The left-of-the-center lyrics and alternative pop (with a great bass line) of Armchair Anarchist are sure to be a crowd favorite, as well as the extremely bouncy and catchy Queen Jane. I have to be partial to the great ballad, Sad To See You Go, full of strings and headache. Great songwriting – it’s a Kingmaker track not to miss. Before you know what happened, you’ll be dancing along and grooving to the solo of Ten Years Asleep, only to find yourself singing along and accepting the lyrics that wish that you wouldn’t have to be singing: It wouldn’t happen in another world / It couldn’t have happened to a nicer planet / It would’ve happened in another world / So don’t pretend to care…when you don’t care. There’s more than enough introspective lyrics and catchy melodies here to keep you interested. I’m not making it one of my “two track” recommendations, but even the simple touch of kicking the record off with Playground Brutality, including its slow instrumental build which caps off the less-than-three-minute track in a flurry of guitars and power – it’s a stroke of a band who knows when to push forward and when to restrain themselves. They know what they’re doing.